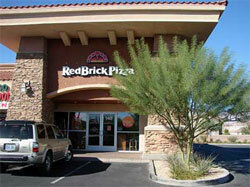 This RedBrick Pizza café is well located at the Mall at St. Matthews in Louisville and has the 'Classic Italian' design. The lease is transferrable at an attractive rate and there is a tremendous opportunity to grow sales. No experience is required to become a RedBricks franchisee as a comprehensive training program and ongoing support is included. This franchised business has huge market potential. •	Gas fired oven with stone baking platform creates artisan crust. •	Premium all natural cheeses, meats, and gourmet toppings. •	Proprietary handmade Original or Gluten-Free dough is quickly formed with unique press. •	Custom oven sears pizza at 750°F in just 3 minutes creating a delicate, golden crust with crisp center. 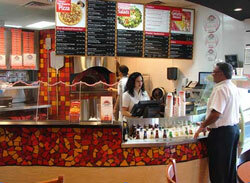 •	Customized gourmet toppings provide customers with healthy options. If you want to own a pizza restaurant but you want to do something a little different, this RedBrick Pizza has the answer for you. Our brick oven baked pizza lets you offer your guests something out of the ordinary – old world pizza artistry with a dash of the new. In addition to all the traditional toppings and flavors everyone knows and loves, we’re constantly innovating. Whether your guests are looking for four cheese or Thai chicken, they’ll be satisfied. RedBricks pizzas bake in just 2 to 3 minutes in our 1000 degree brick ovens, meaning you can serve your hungry guests quickly. They’ll also be glad to know that we care about the ingredients that go into our pizzas. Our menu is free from butter, artificial flavoring, and MSG. Salads are chopped only when they’re ordered, and none of our dressings contain trans fats. In a time when guests are becoming increasingly aware of the connections between food and health. We believe that a health-conscious menu is essential to bottom line success. In addition to fresh salads and brick oven roasted pizzas, which includes Fhazani® (a fire roasted flatbread sandwhich unqiue to RedBrick) sandwiches, gelato, and even wine and beer are served where permitted. In addition there is a separate gluten-free menu ensuring that families and groups with a gluten-intolerant member won’t be afraid to dine in this RedBrick Pizza franchise location. 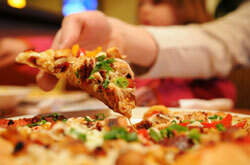 Fast-casual restaurants are the fastest growing segment of the economy. In a busy world, people appreciate the benefits of eating out, and food that’s affordable, healthy, and quick is in high demand. RedBrick Pizza delivers on all counts.